Asora has undertaken the development of local and regional guidebooks to private and public schools to fill a market niche that is presently not served or under served by other types of guides. RIMA-Guide-01.pdf is a prototypical guidebook to the K-12 private and public schools of Rhode Island and Massachusetts as well as to supplementary resources and providers parents could use. It also gives parents and others strategies to consider in their efforts to improve their children's education. BristolGuide-03.pdf is our prototypical guide booklet to private and public schools in Bristol County, Massachusetts and to many supplementary resources and providers in the K-12 education sector located there. It also provides a measure of the taxpayer burden attributable to unskilled adults receiving government services beyond the usual government costs pertaining to skilled adults, over their lifetimes. OrangeCountyGuide-02.pdf is our prototypical guide booklet to private and public schools in Orange County, California and to many supplementary resources and providers in the K-12 education sector located there. ShelbyCountyGuide-03.pdf is our prototypical guide booklet to private and public schools in Shelby County, Tennessee and to many supplementary resources and providers in the K-12 education sector located there. MTAVillage_06.pdf is our (somewhat dated 2011) guidebook to public schools and supplementary services for the region of MD-VA-DC. MTAVDigitalAppendAandB.xlsx contains all of the tabular information, including the NAEP estimates, that accompanies the guidebook. MTAV-Color-Figures.pdf contains all of the Figures and captions of the book, It Takes More Than A Village, and its Appendix D. It is provided mainly as a supplement for those who are reading the e-book version on black & white e-readers (rendering them blind to the colors used to differentiate different groups). 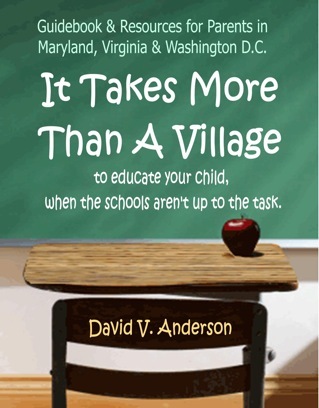 The book aims to help parents in two important areas of need: To find a better school. And to find supplementary services when the schools fall short (as they almost always do). Or you could consider using the contact page to send us an email to make alternate arrangements. For example, we could mail you a hardcopy version. All of the tabular information associated with the book, including all of our NAEP estimated proficiencies for schools and districts, is provided gratis in a spreadsheet file. We generated NAEP estimates for schools in the East Coast states, but abandoned the effort for lack of external support and collaborators. Please contact us for further information about Asora Education Enterprises many ongoing efforts, including these guidebooks and our plans in other areas.